Ooops! It seems I completely forgot to blog! I have been really busy recently, a day embroidery class, 3 days at the Bag Retreat with Mrs H, then a week in Devon with my family saying goodbye to mum. It hasn't left much time for making, blogging or reading blogs. I'm behind by 10 days on my reader and I have scores of unanswered emails in my inbox... I hope you'll all let me off this time! 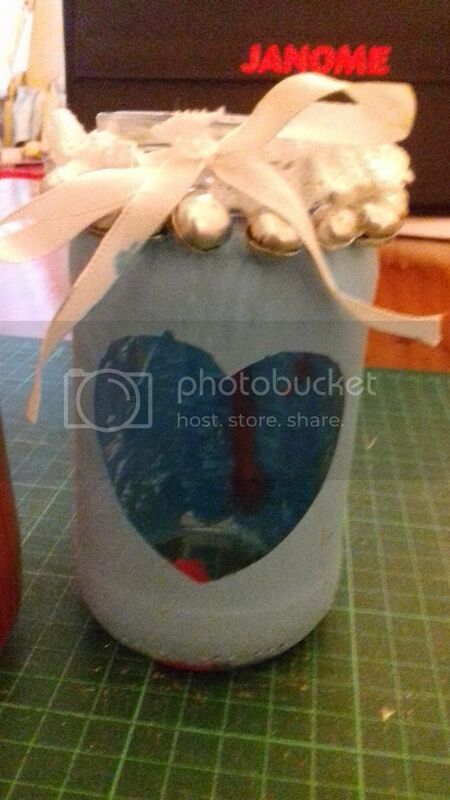 I've mentioned before that a friend of mine has started a Christmas Craft Club, well we had another meeting earlier in the month and made candle jars. 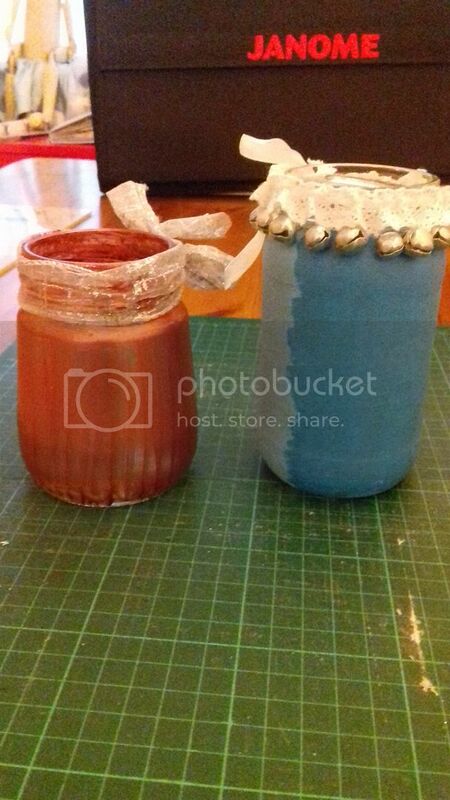 We used sticky-backed plastic to mask of the areas we wanted to keep clear and then painted the jars. I decorated the top of this one with some jingle bells on wire, and a bit of lace that I threaded ribbon through. 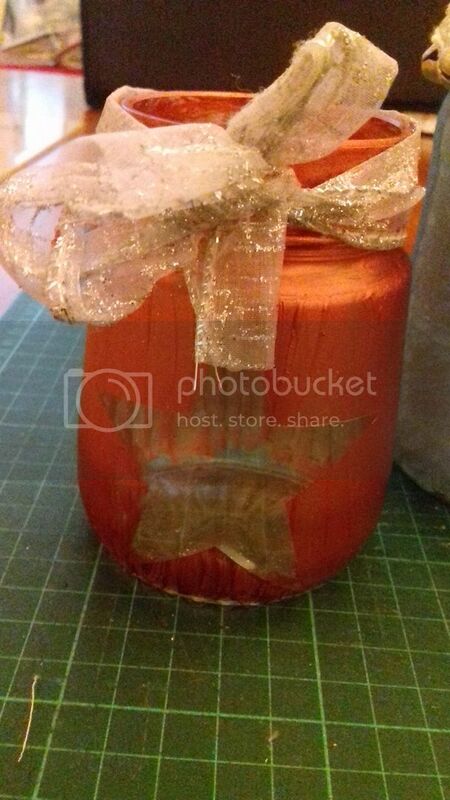 I love the colour of this one, it just has a simple ribbon topper. They are for using with little tea lights, no idea if the ribbon is dangerous! It was really hard to get the paint on evenly - we used acrylic paint which probably isn't the best kind of paint for the job, some of it is scratched off already! I tried a two-tone effect on the blue one - probably not that successfully! I'll be back on Sunday with a SAL update - if I get a chance to stitch!! That looks like a fun project. I am sure the ribbon will be fine with a tea light, as long as you don't have cats or a small child! It must have been good to spend time with family though tough saying your final goodbye to Mum. Bag making course sounds good, I have just ordered 5 metres of car headliner for bags much cheaper than bosal and is the same without being iron on, will have to make bags now! There are glass paints which are translucent, which allows you to create a stained glass effect. Some of them can even be baked in the oven, I think, and then they shouldn't scratch off. Although I've not tested that!